GUNNISON – The Colorado Division of Wildlife released 62 pronghorn antelopes in the Gunnison basin last week to boost the population in Colorado’s Western Slope. Officials released the animals about 20 miles southeast of the town of Gunnison. The animals were trapped earlier in the day on private property in an area northeast of Pueblo with an abundance of pronghorn. Hunting is not allowed in that area, and the number of pronghorn is greater than the population management objective set by state wildlife officials. Relocating animals is an established wildlife management technique used nationwide. In the Gunnison Basin, the animals were released south of U.S. Highway 50 and east of the Cochetopa Canyon. Pronghorn are native to the Gunnison Basin, but they do suffer during periods of extreme weather. 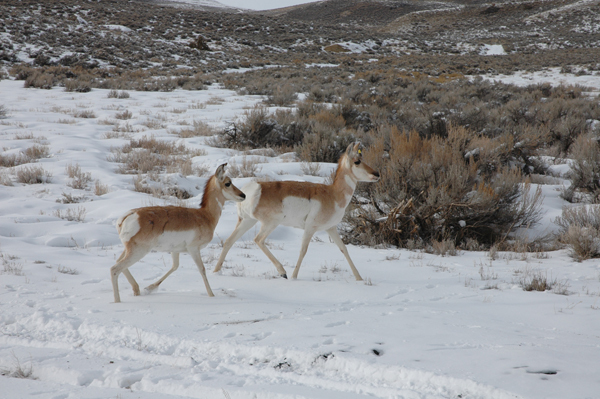 During the severe winter of 2007-08, more than half of the estimated 600 pronghorn in the basin died because of the weather conditions. The Division of Wildlife estimates that prior to Friday’s relocation, only about 300 pronghorn roamed the vast sagebrush hills. A previous transplant came after the severe winter of 1984. Pronghorn were trapped in the Trinidad area and relocated to supplement the few remaining animals that existed in the Gunnison basin at the time. To trap the Pueblo pronghorn, Division staff built two quarter-mile fences, angling them to form a funnel. A low-flying helicopter then herded the animals into the fenced area while about 100 DOW biologists, staff and volunteers formed a line and walked slowly behind the animals, corralling them toward the small end of the enclosure. Once the animals were at the narrowest point of then funnel, workers dropped a net over them. The people who had formed the line then ran toward the animals, held them down, quickly placed blindfolds over the animals’ eyes to calm them, and bound their legs. Workers placed an ear tag on each animal to help biologists track their movements in the Gunnison basin. The hobbles and blindfolds were then removed as the pronghorn were placed on beds of hay in horse trailers and transferred to the release sites. DOW veterinarians were on hand during the entire event to monitor the animals.